Come along on a creative and culinary weekend in the fabulous South of France. 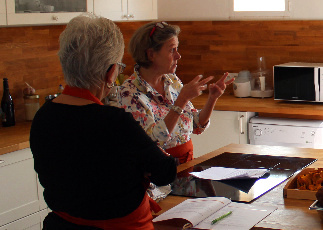 Lead by Annette Morris and Anne de Ravel, this 4-night weekend combines sketching workshops, cookery, food and wine tasting, the perfect getaway for singles or couples. Languedoc is France's best kept secret. An area surrounded by vineyards as far as the eye can see, fabulous historic cities, beautiful Mediterranean beaches, stunning mountain trails and, of course, the world-famous Canal du Midi. Sketching inspiration is around every corner. The Sketching & Food Weekend gives you the opportunity to sketch scenes of this colourful region while discovering the very best Languedoc has to offer. From your base in a comfortable and charming B&B in Quarante, we will travel through some of the most picturesque spots and discover the rich cultural history of the area. We will meet artisan producers and sample the rustic traditional charcuterie. You’ll lunch at many venues favored by the locals. Along the way, you will become skillful sketcher and get first-hand knowledge of the region’s cuisine and wines. Sketching: ErinHill Sketching is a system that shows you how to capture a moment in time, your impression, your way. Step-by-step you'll be guided through the fun process of learning how to really 'see'. A photo takes less than a second, but the few minutes you spend observing details and bringing your sketch to life will create a memory that lasts for years. Saturday - Travel with Annette to Narbonne for your first sketching session. Lunch at one of the colorful restaurants in the Les Halles (non-sketchers are welcome to join) before returning to La Maison de Quarante. You will have time to relax in the afternoon before a wine tasting. Dinner will follow. Sunday -- You’ll be sketching at one of the region’s finest outdoor markets. Lunch at a local restaurant (non-sketchers are welcome to join) before returning to La Maison de Quarante. The afternoon will be free to spend as you wish before the evening cooking class and dinner. Annette has lived in Languedoc since 1998 and passionate to share her enthusiasm for the area. She has trained and worked extensively with Erin and will always see that everybody is working at their own pace and ability. Four (4) nights' accommodation with breakfast.